It's no secret I love paper stuff (scrapbook papers, notebooks, journals, ledgers, letters, books, files,...). Maybe they bundled me in paper when I was a baby, causing my paper passion:-) Who knows what draws me to it, but I do love it! On Pinterest I came across this unique little book of notes from Hello Friend. 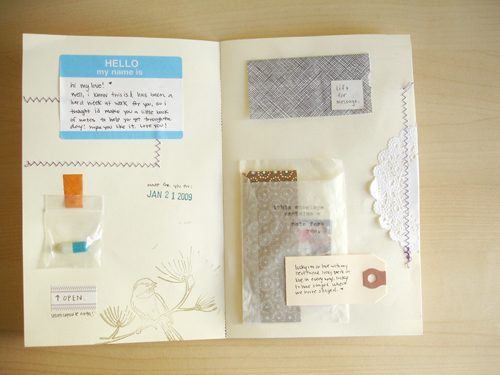 It's filled with notes tucked into envelopes and pockets. I gotta make one of these! It would make a lovely Valentines gift. When I read on to find out the idea for it was based on a children's book, I loved it even more. I adore childrens stories and thought this was such a fun book. The Jolly Postman has letters written by fairy tale characters that are tucked into the book. How fun is that to come across those letters as you read the book! I can't wait to read this one with the kids! The Jolly Postman is one of my all time favourite books for kids. Enjoy reading it with your kids. Fab idea. 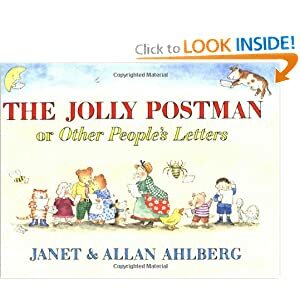 I love The Jolly Postman, I had it as a kid and I bought it for my five year old daughter this christmas! Oh! I LOVED that book when I was a kid! ...I wonder if my parents still have my copy. If not, I'll have to get one when my little boy is a touch older!